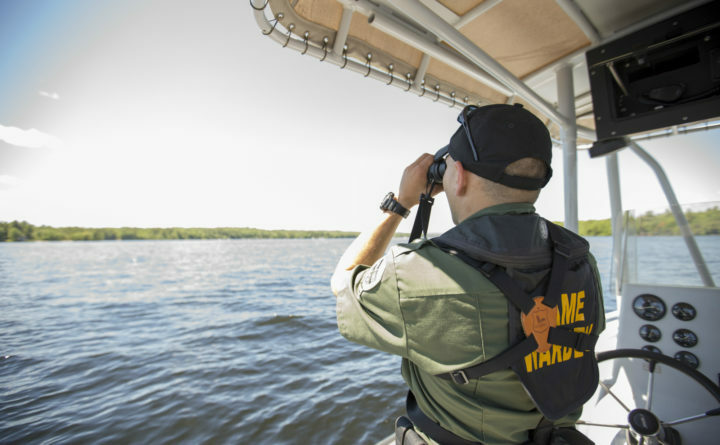 A game warden looks out onto Sebago Lake for boating activity. Last weekend, Maine wardens put in over 1,200 hours of work during a weekend of heightened awareness for drinking and boating. During a three-day raised presence on the state’s lakes, rivers and ponds, Maine game wardens charged eight boaters with operating under the influence, and issued 100 summonses and 328 warnings for various boating violations, according to the Maine Warden Service. Operation Dry Water, a campaign that started in 2009, is a national initiative aimed at decreasing the number of Americans who boat while impaired, according to the Operation Dry Water website. The Maine Department of Inland Fisheries and Wildlife said in a press release that 80 wardens participated in a three-day awareness event that kicked off Friday, June 29. “Those game wardens spent over 1,200 hours enforcing recreational boating activity, inspecting nearly 2,500 watercraft with 5,400 operators and passengers,” the press release stated. The most common violations game wardens encountered had to do with safety equipment, registration requirements and safe operation. The wardens encountered close to 50 nonboating related violations as well, two of which included adults providing a location for minors to consume alcohol, according to the press release. This three-day raised awareness event is always scheduled around the Fourth of July, a holiday usually associated with drinking, according to Operation Dry Water. According to Maine Game Warden Cpl. John MacDonald, good boating weather contributes to the number of people on the water, and to violations. “More than anything it follows weather patterns,” MacDonald said. The Fourth of July usually kicks off the summer boating season, which means wardens will still be on the water. “It isn’t just a matter of, ‘We’ve done it and now it’s done,’” MacDonald said.